Did I mention dungeons were a recurring theme this year at Prime? That was certainly the case with the new expansion to Guild of Dungeoneering, called Pirate’s Cove. 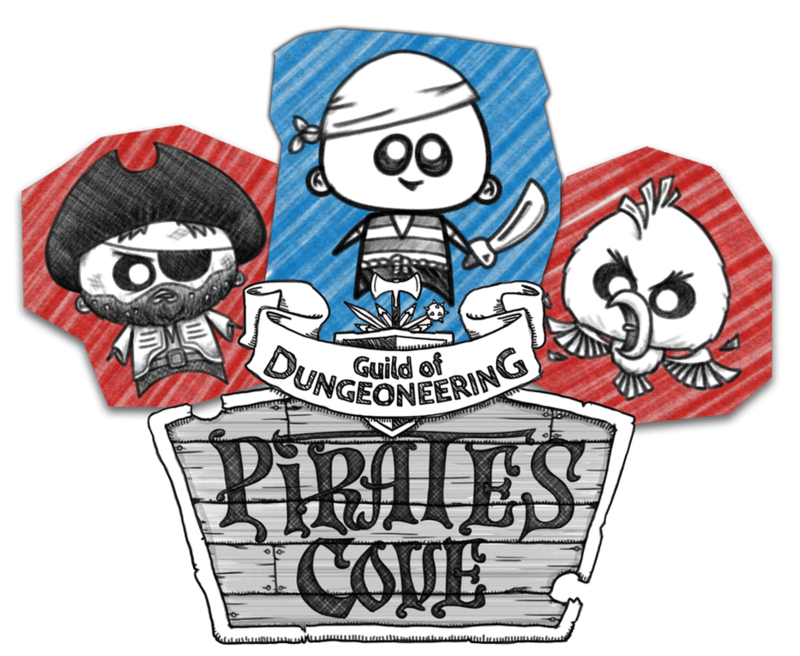 Let me be forthright and say I have never played the base Guild of Dungeoneering game before, but something about the art style of Pirate’s Cove spoke to me. When I heard the cutesy graphics meshed somehow with a brutal and fun dungeon building rogue-like, I was intrigued. How did my first foray into the world of Dungeoneering go? 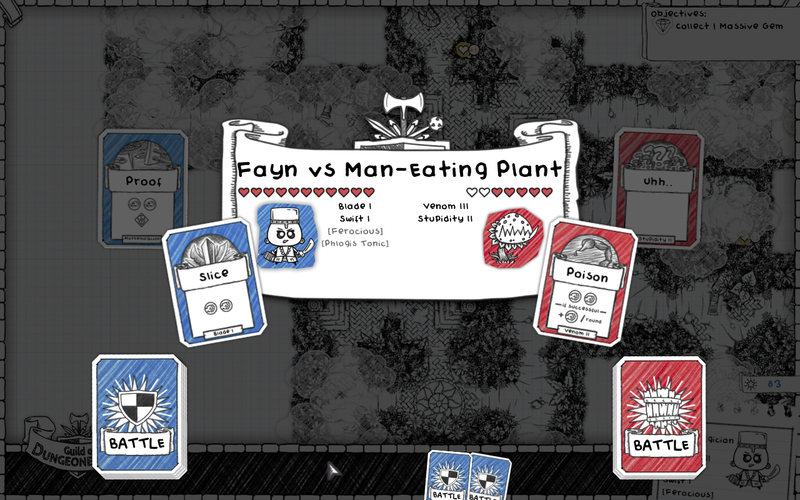 Like I said earlier, Guild of Dungeoneering is a rogue-like, but a very unique one. Instead of you directly controlling the protagonist, from which you pick randomly at the start of the demo, you shape the dungeon around them. This is done via a random deck of cards, which control everything from placement of dungeon pieces to combat. The only rule is you have to place three dungeon pieces at the start of each turn, and those can range from pieces of the labyrinth to enemies to gold dubloons which draw your hero towards them. Just to keep things interesting, you don’t have unlimited time to screw around. Your goal is to make your way to the Quartermaster in a set amount of turns, and failing to do so results in a Game Over. After having the basics explained to me, I rushed headfirst into battle. Suffice to say, I faced a bit of a learning curve. The first two times I fought a foe, the very first foe mind you, I was utterly destroyed. I realized I had to pay more attention, so I went into my third attempt with some more caution. Combat is deceptively simple. Each turn, you draw a group of cards from your deck, and select an action from one of them. The cards will display how much damage they inflict, or block, or even a combination thereof. Several cards that inflicted heavy damage also cost me one heart, making them a bigger risk, while others did nothing but block, and others had special effects, like healing me each time I successfully blocked an attack. So it’s a bit of paper rock scissors, but with a lot of hidden complexity. Once I figured this out, I managed to defeat several foes and level up. Each enemy you defeat increases your level by one, and you have an opportunity to get some of their loot or just grab their gold. The upside to the latter is you might want to hold on to a previously won piece of equipment, so it makes more sense to go for the dubloons instead. I finally made my way to the Quartermaster, and was almost able to defeat him, but couldn’t quite cut it. Overall, I really enjoyed my time with the Pirate’s Cove expansion. 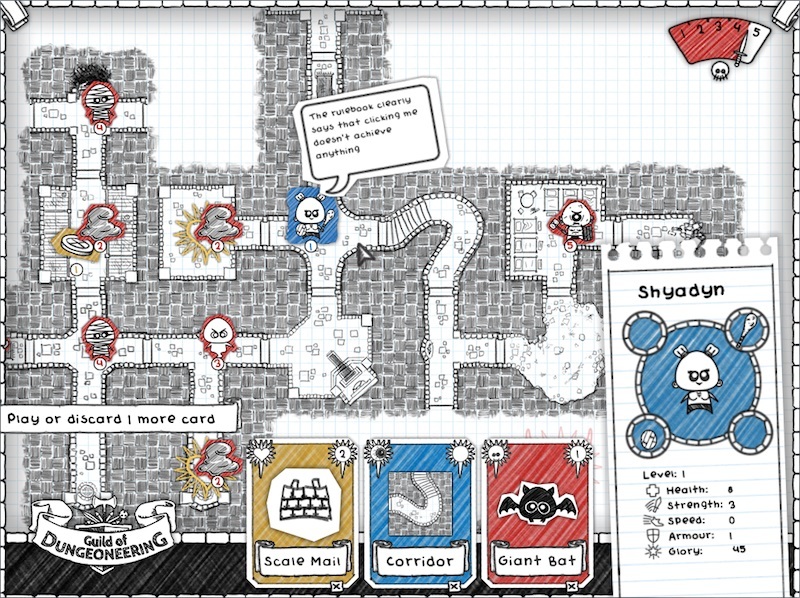 If you are interested in the world of Guild of Dungeoneering, it’s already available on Steam. Meanwhile, the Pirate’s Cove expansion is slated to release at a later date for $4.99, and will add 1 new region, 2 new classes, 5 new adventures and lots more monsters and treasures. If you’re a fan of rogue-likes with card mechanics, you can’t go wrong with Guild of Dungeoneering. Just don’t be fooled by it’s cutesy art, cause this game is s real challenge.